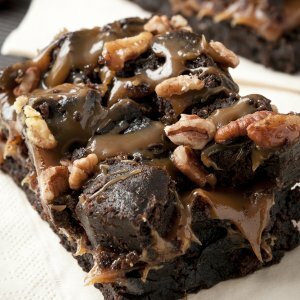 A Delicious Brownie recipe, smothered in sweet caramel and pecans. Grease the bottom and sides of two pans. One 9x9 inch baking pan and 8x8 baking pan. Put the butter and chocolate in a medium heavy-bottom saucepan over low heat and stir constantly until melted and smooth.Remove from the heat and set aside. In a medium bowl, whisk the eggs until well blended. Slowly whisk in sugar and whisk vigorously until well blended. Whisk in the melted chocolate mixture, vanilla extract, and salt. Whisk in the flour and cocoa powder until blended. Divide the batter into the two prepared pans. Bake 20 minutes or until a until a toothpick inserted in the center comes out clean. Transfer the pans to a wire rack. Let cool 5 minutes. Remove entire brownie from the smaller pan and cut into ½ inch squares. In a small pot bring sugar, lemon juice and water to a boil. Remove the pan from the heat and carefully add the cream. Once the bubbling has subsided, add the butter and gently whisk until completely melted. Whisk in the vanilla extract and salt. Pour half of the caramel topping over the brownie in the 9x9 inch pan, then top with cut pieces of brownie and pecans. Drizzle with remaining caramel. Refrigerate until caramel is set.